Yummy, healthful food at Sonya's Garden. Check out the photos! 09.04: Most of What I Need to Know in Life I Learned from U.P. » To The Malls, To The Malls! For months, my mother-in-law had been asking my family to set aside a day to have lunch at Sonya's Garden, a restaurant located in Tagaytay, in the Philippines. Finding it difficult to go on leave during a working day, we ended up visiting the place on December 30, 2000, a Saturday, a holiday, and yes, the day of the Metro Manila bombings. We left Makati at past 10 in the morning. It took us more than 2 hours to reach the place and about three hours to come back. We practically spent the whole day travelling to have lunch in that place. Believe me, though, it was all worth it. In fact, I can't wait to go back. How would I describe the place? It's a place you shouldn't be caught dead in with a guy who intends to propose to you but whom you don't have any intention of marrying. Why the description? Well, with the ambience of the place and all, you might find yourself saying "yes," surprisingly. Sonya's Garden is relaxing to say the least. 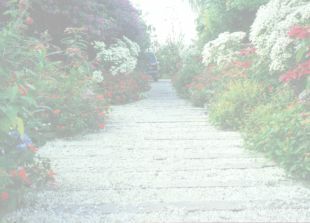 To get to the restaurant, you follow a winding path lined with small, white pebbles. There are flowers all around. It's a garden, remember? Your eyes rest on light blue, bright fuschia, orange, violet and white blooms. Your ears hear the lulling sound of water from small fountains and rain tubes. As you walk around, there's a hammock that both kids and oldies can try. There are areas where people can sit or lie down to read a book, all framed by soft, white, flowing, curtain-like cloth. The place is likewise interesting. There are small cottages (we saw at least two) with unique, colorful stained glass doors. Unique collectibles are scattered everywhere. Antique jars, masks, chairs, wind chimes. There are plenty of items to look over and talk about. The bathroom for women is also very spacious. It is likewise filled with antiques and flowers and you sort of ask yourself: "Should I really be using this bathroom?" Anyway, on to the meal part. Food is served in a dining area which can seat 25 to 30 people. I am told there is another similarly-sized area. Given that the place is relatively small and that you have to travel a long distance from Manila to get there, it is prudent to make a reservation. (Contact: Sonya at 0917 532 9097 or 0917 533 5140.) Lunch is served from 11am to 3pm while dinner is from 4 to 7pm. Price per head is P500 (or about USD 10) for adults and half for kids. Only one menu is served for lunch while there is a different menu for dinner. In other words, all customers for lunch or dinner eat the same food. Getting ready to eat, you notice small things which make the dining experience all the more pleasant. Like rose petals randomly scattered all over your table. The dinnerware used are also not uniform but all attractive, with floral designs. Checking the brand, we see Rosenthal. As to the food, you start with the salad, my personal favorite. The leafy greens are grown in the garden itself. The rich and tasty dressing is perfect with the delicious toppings of varied textures and tastes. Toppings served are: finely chopped hardboiled egg, sliced chico (a small, brown fruit) with just about the right firmness and ripeness, sweet mangoes, crunchy nuts and cucumbers, cheese, and corn. The salad is followed by bread served with several different dips: sundried tomatoes, white cheese, mushroom, and chili, followed by pasta with two sauces. The pasta sauces are: tomato-based and white cream sauce. These can be mixed with shrimps, anchovies, and olives which are also provided separately. For dessert, there is sweet banana thinly coated with caramelized sugar, and sprinked with sesame seeds all over. There is also sweet carioca. To end the meal, hot water with mint tea leaves is served. This piece is really making me hungry and leading me to dream of going back to Sonya's Garden. So, when you have the chance, visit the place. It has good food and peaceful surroundings on its menu daily. It is worth the drive, anytime. Take the South Super Highway, then use either the Carmona (recommended) or Sta. Rosa (heavy traffic) exit. Proceed to Tagaytay, then continue on to Batangas. About 5 minutes from the "Thank You for visiting Tagaytay" sign, you'll see a subdivision on your right (Buck). Enter that subdivision (dirt road) then after about 5 minutes you'll see the sign "Sonya's" on your left. Turn left, park, enjoy your meal. Remember to make reservations. Revealing the Secret of Sonya's Garden (Feb 2001, Philippine Airlines Mabuhay Magazine) [Hmmm... chico in English is sapodilla?] -- "There is one that is partly hidden in a corner and is appropriately called the "seduction corner" where you will find a futon mat covered by a white cotton native blanket and throw pillows." Where is Sonya's Garden? (July 02, 2001 | GetAsia | By Troy Bernardo) -- "In her wildly-strewn garden, you can find hammocks, figurines, and a myriad of flowers: blue and pink hydrangea, orange dumbia, orange impatian, white Peruvian poinsettia, and forty other varieties. This soothing visual candy prepares you for the gastronomic delights ahead." Sonya's Garden (FemaleNetwork | By Anonymous Foodie) -- "Sonya�s Garden is located in the town of Alfonso, on the tip of Tagaytay that is practically in the Batulao turnoff already. Once you pass the Splendido Club on your left, you will see a blue metal arch that says Buck Estate." A (not so) Secret Garden (Phil-at-Home | By Margarita De Pano) -- "Sonya says that childhood memories likewise contributed to the preservation of such an extraordinary pocket of nature. Growing up in Capiz (western Mindanao), she recalls spending time with a green-thumbed grandmother so enthusiastic she wakes Sonya up in the middle of the night just so she can smell the fragrance of nocturnal flora."